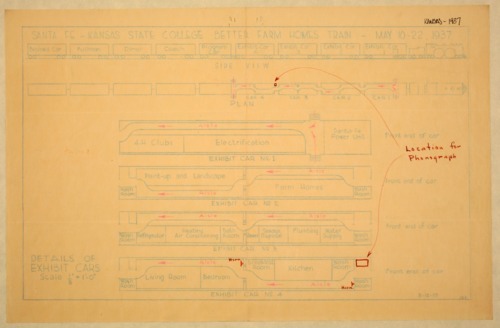 This item has two different options for exhibit cars for the Santa Fe - Kansas State College Better Farm Homes Train scheduled to travel in Kansas May 10-22, 1937. Both pages show all of the cars to be included in the train. Page one has layouts for four exhibit cars showing different parts of a home. Page two is less detailed and has only three exhibit cars. It also has a proposed organizational chart but no individual names on the chart. Page two indicates that three stops per day would occur. No specific locations for the stops in Kansas are given.